One of my favourite places to source inspiration comes straight from nature. There’s so much beauty in the simple details and I always try to take the time to stop what I’m doing to take in my surrounds. When I go for walks, I like to look up at the trees, the sky, the bare branches. I’m also very lucky because I have the most beautiful garden that’s filled with blooming camellia trees, magnolias, a stunning crepe myrtle, lavender and flower bulbs galore. It’s so hard to not be inspired by the beauty around us! I was so honoured when bride-to-be Natalie was in touch with me about creating a bespoke gold pearl wedding headpiece for her wedding day. Natalie loved the detailing from the Wild Willows headpiece and so together we started chatting about customising the piece to better suit her bridal look. She sent me photos of her exquisite wedding dress and gorgeous bridal up-do including a photo of her face shape so I could visualise the overall look and modified the design to best suit her beautiful features. Natalie is one gorgeous girl and my goodness, she’s going to knock the socks off her groom that’s for sure. Inspired by the intricacy of nature and botanic beauty, I designed the piece with the lovely Natalie in mind. 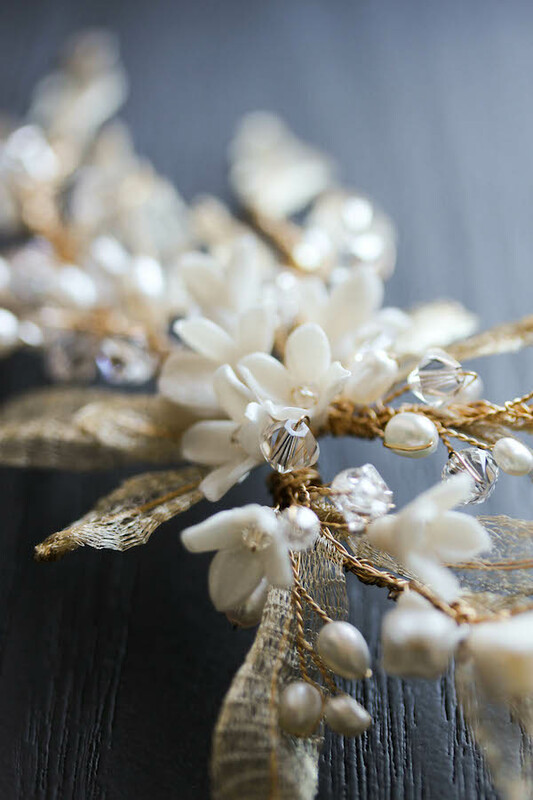 It’s handcrafted from gold jewellery wire, freshwater pearls, darling buds, Swarovski clear crystals and gold mesh leaves. Each little detail was handmade from scratch and all pretty details can be customised. Thank you Natalie for the opportunity to work with you! I wish you all the very best for your special day, I just know you will look amazing!